Blaze 1, originally uploaded by robron1. A house behind ours went up in flames last Saturday night. It’s amazing how fast the fire took hold, we woke up to what sounded like fireworks, looked out the window, and were greeted with this sight. 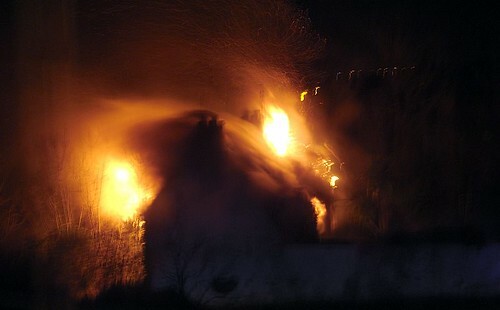 The house was empty for a while so nobody was hurt, and the fire brigade arrived fairly quickly aswell. What we see here is the struggle between the fire and the water from the hoses.